Refined French cuisine cooked by a young and talented chef. : Laurent Lapaire, former maître d’ of Alain Passard -- L’Arpège, officiates among the taupe tones of L’Agapé’s trendy dining room. 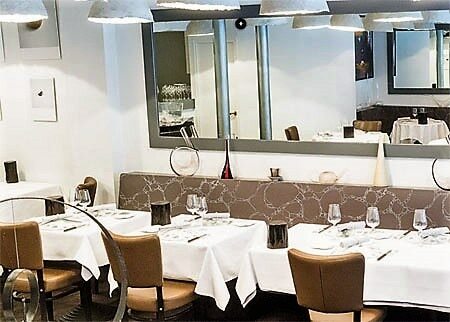 The silverware was specially designed for the restaurant, which is bedecked with Philippe Starck shades and paintings. The Japanese-born Toshitaka Omiya earned his stripes under David Toutain at Agapé Substance and delivers refined French cuisine showcasing topnotch products. He especially prizes variations on traditional recipes and peculiar textures and seasonings. Try the poached foie gras with vegetables in a consommé, served with argan leaves and ginger, or the skillfully cooked Black Angus rib-eye with ceps and eggplants to experience his talent. Pastry chef Rikako Kobayashi also hails from Japan, and her yuzu soufflé enchants the palate. The wine cellar features more than six hundred vintages.